BLAZING SADDLE. A PHOTOGRAPHIC PUB CRAWL. The heat wave continues! I mentioned in my last post how I was Inspired to cycle once more through The Trough of Bowland. I felt I had to get some miles under my belt first to achieve a modicum of two wheeled fitness. So today cycled out to Shard Bridge on the Wyre and back, almost 40miles. The tarmac was melting in places and I had the wind against me all the way home. Good training, The title Blazing Saddle was appropriate by the time I finished in the afternoon heat. 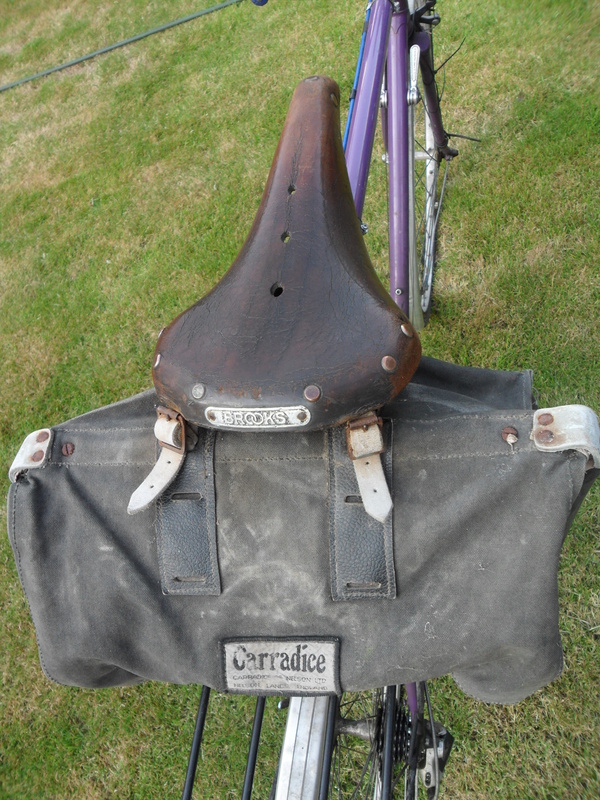 Talking of saddles the picture below shows my well used and worn Brooks leather saddle, at least 60yrs old. Complimenting it is my old Carradice Saddle bag. Both are still in production, for a price, – good design and craftsmanship always win out. Shows my vintage! Picture taking whilst cycling is different to when walking. First it is advisable to stop before shooting, so nothing is spontaneous, and often there is only a winding road to focus on. I made a decision today to just take pictures of the interesting pubs I passed. There is some logic there as whenever you ask directions you get the reply – ‘turn at the pub’ etc. That is a good reason not to change pub names,they are a historical document. Have a good selection of names here, all will be familiar to Lancastrians in the area. Not sure of my results, maybe next time I’ll choose the equally imposing village churches. HORNS INN AND GENTS LOO! ON RIGHT OF ROAD. REOPENED GREEN MAN ON VILLAGE GREEN INGLEWHITE. THE ROEBUCK AT BILSBORROW. MORE RESTAURANT THAN PUB. OWD NELLS – CANALSIDE PUB. THE FRIENDLY GRAPES IN ST. MICHAEL’S. SHARD BRIDGE INN – NOW THE UPMARKET ‘SHARD’ ON THE WYRE. THE SHIP AT ELSWICK. ANOTHER ‘GASTRO PUB’. THE DERBY ARMS, OLD MOTORING PUB AT INSKIP – LOOKS CLOSED! THE BROUGHTON INN, NOT EXACTLY A COUNTRY PUB! Mission completed, next cycling trip should be around The Trough. This entry was posted in Cycling and tagged Cycling on July 26, 2014 by bowlandclimber.